Sure, you’re limited to the three DMODS that come pre-installed (App Store rules, grumble) but hey, they are three good ones at least. Special thanks to MsDink and Linus for permission to include their work. 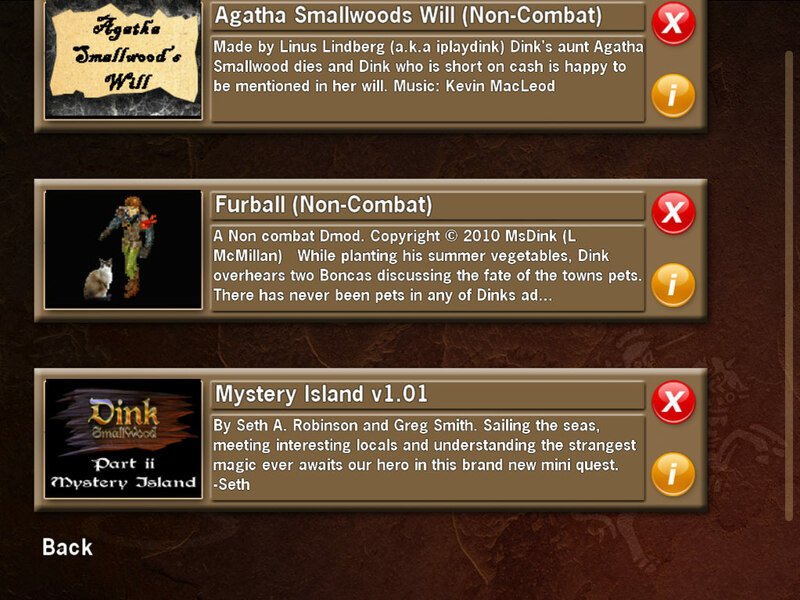 I did tweak Mystery Island to be slightly easier for this iOS version. The other two DMODs are “non combat” – this means they are more adventure oriented (more talking and puzzles) and less arcady. Perfect for iOS! A few days ago I got to see Dink on my friend Kazu-kun’s iPhone4 (yeah I still don’t have one) and wow, Dink is gorgeous on that retina screen. It’s not just iPhone sized zoomed up, I actually do render more detail. The hassle was worth it. 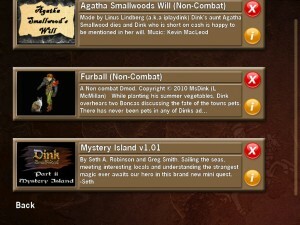 This entry was posted in Development/RTsoft, Dink Smallwood on October 23, 2010 by Seth. Hi, love the game on the iPhone. How do I play the new scenarios though? I beat the game, do I have to start a new character for the new scenarios? To access them, use the new “Add-ons” option from the main menu.